Confused about RV brands? You’re not alone. 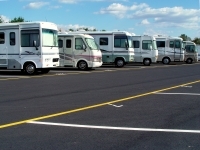 There are dozens of RV manufacturers in the industry. Many RVers are overwhelmed with the choices available. How can you decide among the various brands? Buying the wrong brand can be a disastrous decision. The worst choice is to buy an off-brand that nobody’s ever heard of. There are several factories slapping together cheap, defective RVs. Avoid these at all costs. As an extreme example of how bad these can be, three of these factories used to sell via the “gypsy dealers.” These were families that traveled the country, selling coaches from parking lots, campgrounds, or motels. The gypsies bought RVs cheap from the factories, and hauled them around the country. Usually they were sold by polite, well-dressed women who told convincing hard-luck stories about family illnesses, or needing to raise money fast for something. The RVs they sold were very poor quality—two of the three companies were known to build their RVs with defective plumbing and insufficient venting. As a result, almost all RV service centers refused to work on them. RVers who got greedy for one of these “great deals” were stuck with defective coaches that couldn’t be repaired anywhere (short of shipping them back to the factory). In the last few years, the gypsies have been suppressed. Nevertheless, you see how shady some of the off-brand RV manufacturers can be. So what should you do when choosing among travel trailer and motorhome manufacturers? The best way to protect yourself is to only buy from the major manufacturers. This is true for both motorhomes and travel trailers. Unfortunately, this won’t guarantee you’ll never have a problem with your RV. In fact, due to the industry-wide shortage of qualified RV technicians, even the major manufacturers have quality problems sometimes. Nevertheless, with the major brands, if you have problems you can get them fixed. This isn’t necessarily true with the small brands. You want a brand with a large network of dealers to support you, especially for problems that might occur while you’re on the road. And many others as well. Generally, if you see a brand advertising in the national RV media, and a quick look at their website reveals a company that’s been in business for many years, this manufacturer qualifies. I sometimes get emails asking which brand is the best one. Unfortunately, there’s no easy answer to this question. Instead, as I’ve already said, even the best factories produce a bad coach every once in a while. Choose one of the major brands. If you’re considering an RV and you’ve never seen the manufacturer advertising anywhere in the magazines, start asking questions. After that, the most important thing to do is ensure you’re buying from a good dealer. That way, even if you do experience problems, you’ll be more likely to have them solved quickly and painlessly. Before you accept delivery of the unit, give it a thorough, top-to-bottom predelivery inspection. This can take the better part of a day, but it’s crucial. Make a list of every defect you find, no matter how small, and make sure the dealer fixes every single one before you accept the coach. Also, make sure that you aren’t overpaying for the RV in the first place. If you do a little homework before you buy, you can buy an RV for close to or even below dealer cost. Do these things, and you’ll most likely have years of happy RVing ahead of you!